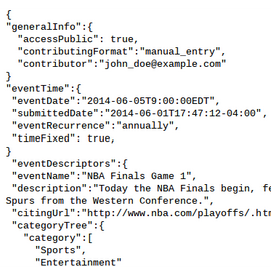 June 9, 2014, 9:54 a.m.
Can you turn future news events into structured data? David Smydra usually works at Google, but he’s spending a few weeks here at Lippmann House as a visiting Nieman Fellow, working on an independent project. He’d like your feedback on it. You can read David’s summary of his idea for yourself, but in brief, he wants to find a way to allow the public to benefit from all the knowledge of future news events locked up inside newsrooms. Reporters know a lot about things that are going to happen or likely to happen. Some of these are highly predictable: Federal employment data will be released on the first Friday of the month. (Except when it isn’t.) Some are less structured: An indictment is followed by an arraignment and preliminary hearings and a trial. (Again, except when it isn’t.) Some are easily findable by a motivated member of the public; some are known only to, say, an experienced city hall reporter who understands the rhythms of the beat. Most of this information stays locked inside newsrooms — maybe in a staff-wide tickler file, maybe in a unstructured Word doc on a reporter’s laptop, maybe only in her head. Could you create a standardized way to gather these future news events in a way that could be (a) useful to the news organization, but also (b) perhaps publishable in some form to readers? That’s the project David is working on. He’s trying to come up with a standardized data format (FN-JSON, which is fun to say out loud) that could be used within or even across newsrooms. He’d love your thoughts. Benton, Joshua. "Can you turn future news events into structured data?." Nieman Journalism Lab. Nieman Foundation for Journalism at Harvard, 9 Jun. 2014. Web. 18 Apr. 2019. Benton, Joshua. "Can you turn future news events into structured data?." Nieman Journalism Lab. Last modified June 9, 2014. Accessed April 18, 2019. https://www.niemanlab.org/2014/06/can-you-turn-future-news-events-into-structured-data/. | title = Can you turn future news events into structured data?